What's it like talking to one of the most amazing "V" actors of all time? I can't even put it into words, just uncontrollable body motions--so picture it people! See the Interview below from February 8, 2010! NEW - 04/23/10 - DAVID PACKER (Daniel Bernstein) just checked in! He's doing well in sunny California while we, in his home state of NJ, are still wearing light jackets in the morning! David and I had a phone conversation for just about 2 hours on Monday, Feb. 8, 2010! David is a thinker about things in general, such as life, business and his career. He has lots to say, so let's hear it! The burning question, of course, is if David has ever seen ABC's version of "V."
We never actually SAW Daniel Bernstein killed. He was just dragged away in "V:The Final Battle” to become lizard food. However, if KEN JOHNSON's film gets made, it will most likely take place right after "V:TO" meaning Daniel Bernstein is still alive. Which we can only hope means…!!! 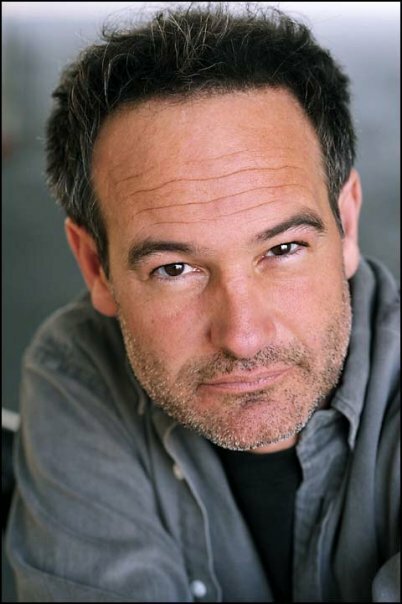 One of the most memorable characters David has portrayed in his acting career is Daniel Bernstein. As a "stupid 19 year-old kid," as David puts it, "I was so about the art of it and didn't really understand about the business end. I put my heart into it. After Ken Johnson left the show, I just did 'The Final Battle' because I felt I owed it the story. I asked for them to write me out because technically I was not under any contractual obligation. Back then I had no understanding that business realties don’t necessarily go hand in hand with artistic items. I regret not making the business decision to stick with the show; I would own a house in Laurel Canyon. You know it’s funny, I was so caught up in what Ken was trying to accomplish I had no understanding back then how huge the show was with the public. My first inkling of the popularity was that shortly after the show aired, I happened to be in Atlantic City with my sister and her husband and the second we walked into the casino about 50 people came over and recognized me. That was the first time anything like that had happened to me. I had no idea that was possible." David explained how contracts work. The actors are contracted for a seven year period even if the show is cancelled or not picked up. The networks hold all the cards. So would David do Ken Johnson's "V" film if asked? "Yes, in a second. I love Ken. I've always loved Ken. I would love nothing more than that." Yes!!!!!!!! David also shared some personal stories. When I told him how my three kids, baby KJ, Tyler and Anna, were in show business, David immediately went on to defend the kids' well being. He said he's been around many different stage mothers, some who are all about the glitz and glamour, and others who have the child's best interest at hand. David used a prime example of the actor from "Lord of the Rings," Elijah Wood. David said, "I worked with Elijah Wood previously to 'LoTR' when he was 8 or10 and his mother was the most hands off stage mother. She said, 'This is what Elijah's doing now [acting.] But, he also has homework, he has a bedtime, he’s still a kid. He'll do this [acting] until he doesn't want to do it anymore and all the money is going into his college fund.’"
David, at the time, was reading a book about the Kennedy assassination. He hung out with Elijah and talked to him about the book. Amazingly, Elijah was not only very interested but participated in the discussion. Afterall, he was just a kid. “I thought I was boring him to death,“ David assumed. "Years later after ‘Lord of the Rings,’" David continues, "I was at the Beverly Center (mall in LA) and I hear 'Hey David' and I see it's Elijah. He was like, 'I don't know if you remember this, but when I was a kid, you sat and talked to me about the Kennedy assassination.’ Elijah told me it really made an impact on him and that really meant a lot to me because I, in a million years, wouldn’t even have thought he remembered that." Another fun story is that David is a huge "Star Trek" fan and on one project, a movie called “Infested’ done in 2002, he actually got to work with Robbie McNeill from "ST: Voyager." Robbie directed the pilot of "Chuck" (by the way, the new showrunner on ABC's "V," Scott Rosenbaum, is from "Chuck.") “It was such a trip hanging out with someone from a show that I really enjoyed watching,” David said. “Again, I felt awkward going up to him,” David continued. “Well, later, we were in the elevator together and finally one of us broke and said, ‘Hey, weren’t you at that screening in California two nights ago?’ and we both said ‘Yes’ and finally introduced each other. We were like, ‘Hey, my name is David and your name is David…’ and since neither of us had anyone to hang out with, we became friends. A lot of the times ‘The X-Files’ was shooting in the same abandoned building as I was shooting ‘Birdland’ so we had a thing where a production assistant would come over and give me a message from David about meeting for lunch. As soon as I had a break, I would run up to David Duchovny's trailer and we'd watch videos until we had to work. It was a really fun and innocent time." Now, for all you ladies out there who have been pining over David the past 25 years, he has a lady friend who puts up with him, so hands off! David himself doesn't have any children, but his lady friend does and he's experienced parenting through the eyes of others and enjoys the experience from a different point of view. His best friend, Jay, has a couple of kids who are older now so David has some great memories. What types of jobs did David have when he first moved to Los Angeles? While he was trying to break into acting, he had a job at the local movie theater. Everyone was trying to become an actor so the theater manager was not impressed with David always saying how he's going to be an actor for a living. The time finally came when David landed a role on one of the earlier TV shows like "Fame" or "St. Elsewhere" and he still continued to work at the movie theater. Well, the theater manager sure changed his tune when both shows were on in the same week! Then the point came where David wanted to take his acting career to the next level so he left that job. David recently finished a movie over the summer with Michael C. Hall and Sarah Silverman called "Peep World." David previously worked with the Director, Barry Blaustein, on a pilot "What's Alan Watching?" in 1989. So be sure to look out for this film to get your dose of David Packer! David is currently in Colorado working on a project. I asked him if he was enjoying any of the winter sports and he said, “I don't ski because I tend to injure myself when I'm outdoors. However, I like the snow and the environment." David sent me some pictures of perfect snowflakes on his jacket. What a wonderful way to end a conversation! NEW - 02/08/10 - What in the universe could DAVID PACKER and Ilana talk about for 2 hours?? Find out when I post about today's amazing phone call! Coming Soon! David came across my website one day and emailed me! Yes, at first I was skeptic (considering how many emails I get), but by the 2nd email, I knew it was him. I was *so very happy! * when he agreed to let me interview him, and he suggested we do a live chat! Finally, about a week or two later, it happened. Sunday, May 23, 1999 to be exact! After the chat, David called me on the PHONE!!! "It was 1984 and the V saga was in full bloom. I was only 13, but I was the biggest fan of V and David Packer -- probably in the world at the time ( or so it was to me). I was so die hard I wrote to the Starlog editor and requested David Packer's home address so I could write to them and tell them what a huge fan I was. This guy (forgot his name, its been like years ago) gave David Packer my home number and he called me at home!!! My parents answered the phone and couldn't believe it!!! It was so cool!!!" <Lizard Lady> Hey thanks for agreeing to this...you are totally making a LOT of people's day :) So this is really you, eh? <dave> You are very sweet. Thank you. I like these letters. They are like the banana republic font. <Lizard Lady> So you're from New Jersey. That's cool. How'd you end up in Calif? <dave> Yeah...NJ. Came out to California in 1982 for the summer and ended up staying...after getting V.
<Lizard Lady> So you're what? around 35? <Lizard Lady> Sorry I missed it--would be fun to see what you look like now! Considering I still have the image of "Daniel" in my head. So you wanted to be an actor or you just auditioned for the blip of it? <dave> No. I definitely wanted to be an actor. That's why I came out to LA. I had been doing a play in New York and a casting director saw me leaving the theatre and he asked me to come read for this NBC pilot. It was a spin off of The Facts of Life. I did not end up getting that but it was enough to get the attention of this manager and that's how I ended up in L.A.
<Lizard Lady> Guess that was a nice culture shock--getting a part and being shipped off to LA! <Lizard Lady> I heard rumors that you didn't want to continue with "V"... true or false? <dave> True true true. In retrospect it was a stupid decision. There was no reason in the world to not do it. But at the time I was idealistic and I wanted to do things if they were artistic. I was very unhappy that Ken Johnson was not doing the show, so I wanted out too. Dumb dumb dumb. <Lizard Lady> Do you keep in touch with any of the "V" actors? <dave> I have to tell you it is really great that so many people are interested in V. I had no idea. Some of the websites are unbelieveable. <dave> Really. How many do you think? <Lizard Lady> We never really did see Daniel being served for dinner. If they did another "V" would you be remotely interested? <Lizard Lady> Yah I think it was in Anaheim.... I was so happy as a kid to go to Calif to that convention, lemme tell ya! <dave> i think i went to that. <Lizard Lady> So what do you do all day in between jobs? Hobbies? <dave> I don't remember the name. As far as hobbies...lots of riding mountain bikes around and hanging out with friends. <Lizard Lady> Do you still have family here in Joisey? <Lizard Lady> Regarding "V" do you remember if everyone was assigned a Laser Pistol or you just picked up one every time you had to work? Also, the triggers on the guns didn't really move right? <Lizard Lady> Hehe that's cool! I heard things were taken from the set...I always wanted one of those ship models! So when you audtioned (if you even remember that far back), did you have to read a scene with anyone? <dave> I read with the casting director for Ken Johnson. The first time I did it, I think I wasn't as good as I could have been. He said..ok, do it again...and I did and then he said..."thats exactly what i meant." Two days later I got the job. <Lizard Lady> That must've been pretty exciting! Your parents must've been going Nuts! <dave> Thank you. I liked it. The whole V thing was very fun for me because i was a huge star trek fan...so to get to actually be in something like that was really exciting. Especially at 19. <Lizard Lady> I can imagine! So who's idea was it for Daniel to always have a lollipop? <dave> You know, I don't even remember that. Was that in the first or second movie? <dave> Wow, I did not remember that. I don't know who came up with that. <Lizard Lady> You still a star trek fan? <dave> Yes, i still like star trek. <Lizard Lady> Who was your favorite "V" actor to work with? <dave> Well, I liked Michael Durell [Robert Maxwell] a lot. But I was partial to Faye Grant [Julie Parrish]. We were very close while we were making the first movie. <Lizard Lady> Did you used to have a webpage? <dave> No. I had a fun thing on pac bell once, but it was only for a few weeks. <dave> Is Faye still happily married? <Lizard Lady> So you were the youngest on the set, aside from the guy who played "Sean"
<dave> You don't have an e-mail adress on Ken Johnson do you? <Lizard Lady> No, but I have his phone #. You'll get his answering machine-- he calls back. <dave> Can I have that? <Lizard Lady> Ken? Nothing as far as I know. Jane just talked to him about a month ago. Anything upcoming for you or you relaxing for a while? <dave> Been writing a lot lately. I am talking some time off before beginning rehersal for a play I am doing at the Los Angeles theatre center this summer. <Lizard Lady> Oh cool!!! Good to see you're still into doing theatre! Which do you enjoy more? TV, movies, or theatre? <dave> So what did you work with Stephen [Collins--Faye's husband] on? <Lizard Lady> On a TV show called "Working It Out" for NBC w/ Jane Curtin. My first tv job out of college. <Lizard Lady> Are you writing a play, or a book...? <Lizard Lady> That would be GREAT to see your screenplay on the big screen! You just writing it or you want to act in it as well? <Lizard Lady> Any feel for directing, or you enjoy writing and acting only? <dave> I directed a play last December. I am very interested in that. Sort of burned out on the acting thing right now. <Lizard Lady> How'd you learn to direct? What play was it? <Lizard Lady> Did you get extra pay for getting wet in that pool scene? <dave> No...and it was cold...but I was wearing a wet suit under it. I think we did that in one take. <dave> I liked that scene. <Lizard Lady> What was so special about that scene? <dave> Wow... man I wasn't happy with the final battle stuff. <Lizard Lady> In what ways weren't you happy? In general, the script, or you?? <Lizard Lady> Out of all your acting jobs over the years, (not directing), which was the best one to work on? <dave> The most fun was almost heroes, with Chris Farley, Matthew Perry and Christopher Guest. <Lizard Lady> Ah, I'll have to rent that movie then! <dave> That was a lot of fun. Unfortunately the movie wasn't very good. <Lizard Lady> Casting for "V" the movies was amazing, don't you think? <dave> Yeah...the casting for V was great...why do you think it struck such a chord with you? <Lizard Lady> Just the fact that the world would stop fighting each other , and come together to fight the aliens...so ironic, peace for war. Plus it had just the right amount of seriousness and action. <dave> That was really the thing "Independence Day" hit upon, huh. <dave> yeah...well Dean Devlin is smart. <Lizard Lady> "V" the Original, to me, is one of those GREAT movies like in black and white-- and V:TFB had all that action and adventure, etc. <Lizard Lady> You're one of the few actors that hadn't worked with Ken before "V"... must be a good feeling knowing you got the part without him seeing your other work! <dave> Oh yeah, you have no idea. Add that to the fact that I really hadn't done much before..just an episode of St. Elsewhere and Fame..and the fact that I did not have to go to network and audition..it was damn cool. <Lizard Lady> I really can't think of anyone who would have played daniel better than you. <Lizard Lady> Did you work on "V" every day or just a few days a week? <dave> Yeah...a few days a week. <Lizard Lady> Fame must've been fun, eh? <Lizard Lady> Do you have any pets? <Lizard Lady> Do you remember any scenes you were in that got cut out of the final thing? <Lizard Lady> [I hear my phone ringing] utoh. And this is where our phone conversation takes place! As soon as David *laughed*-- he sounded JUST LIKE Daniel. It hit me like a wave. We had the most amazing phone conversation! David was very easy to talk to, and took a genuine interest in me and the things I had to say. I found out that one of his best friends is Dean Cameron (the guy who played Chainsaw in that movie years ago "Summer School." When David was 14 he attended his first Science Fiction Convention. That's how he met Kerry O'Quinn, the Starlog editor when the magazine was brand new! And that was the start of a friendly relationship! (which would explain how David heard about that girl Kathi up there). Being a huge Star Trek fan, David Packer was thrilled when he got a job working on "My Talk Show." (years ago). William Shatner was on the same episode! Dave was so excited, that it was hard for him to "remember" that it was Bill Shatner, not Captain Kirk. I told him that I had that same problem when I was working on "Working It Out"--when Faye Grant would be there, I kept calling her Julie! About 15 minutes later, I told David I'd have to let him go or I'd be on the phone with him for the next 8 hours! We were still both connected to the Internet, so even after the phone conversation, I was able to chat with him a little--basically praying to Zon that the chat got saved!! And, as you see, it did! THANK YOU DAVID! If you have a David Packer story you'd like to share on my site, please feel free to send it to me at lizard.lady@mindpulse.com !